Boxing can be a cruel sport to those fighters who didn't save their money or got ripped off along the way. There is no pension and the possibility of having medical insurance is almost laughable. The only shot at something close to a pension is the collectibles industry. For some legendary fighters it's keeping them from abject poverty. 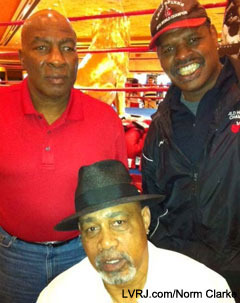 Bill Watson, the owner of Memorabilia International in Las Vegas' Miracle Mile shops, has lent a helping hand to some of the heavyweight stars of the 70's - Earnie Shavers, Ken Norton and Leon Spinks. All three were spotted at a recent autograph signing/photo op event at the MGM Grand and will sign again this evening. The 68-year-old Norton has been battling back from the effects of an awful car accident 25 years ago. He called Watson a "godsend." All three have re-located to Las Vegas to work with the store. Shavers came back to the States after 10 years in England. Spinks recently lived in the Midwest and was working for $5.15 an hour as a janitor. At the request of Scott Sibella, the MGM's President and COO, they'll be signing in the lobby again this evening along with Joe Frazier. Norton (42-7-1, 33 KOs) was the WBC heavyweight champ in 1978 before losing the title to Larry Holmes. He fought Muhammad Ali three times, going 1-2. He and Shavers met in 1979. Shavers (75-14-1, 69 KOs), a huge knockout puncher, took out Norton in just one round. Shavers was 0-2 against Ali, with both fights going to decision. Shavers, 66, actually fought twice in 1995 at the age of 50. Spinks (26-17-3, 14 KOs) pulled off one of the biggest upsets in boxing history, With just seven pro fights on his resume, he shocked Ali in Feb. of 1978. Ali went on to win the rematch in September of that year in the New Orleans' Superdome.